After some Internet searches, I concluded this plant was definitely not Skunk cabbage. The leaves were too different from the images I had found on my searches. 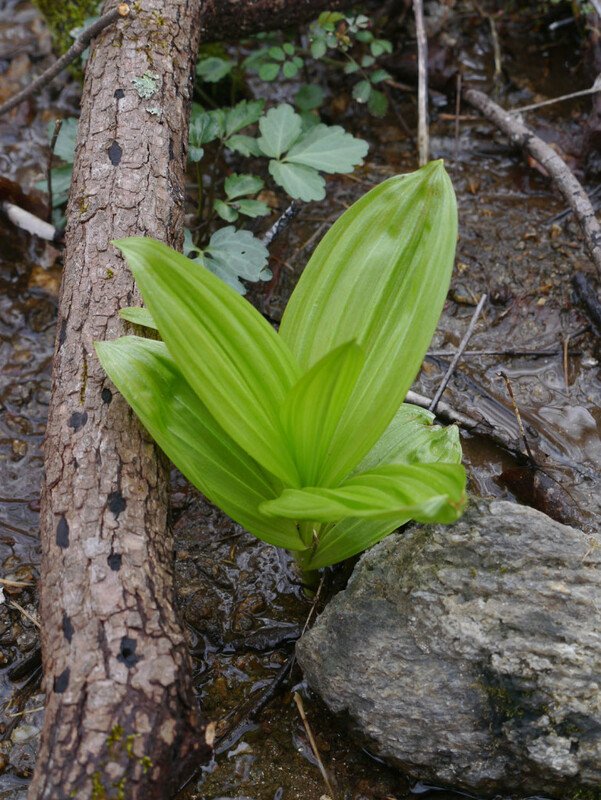 The question then became, “well, what is it?” After carefully working my way through various field guide keys, I realized this was Green false hellebore (Veratrum viride). A year later I came across Skunk cabbage (Symplocarpus foetidus) at a near-by botanical garden. Now I could really see the differences between these two plants! 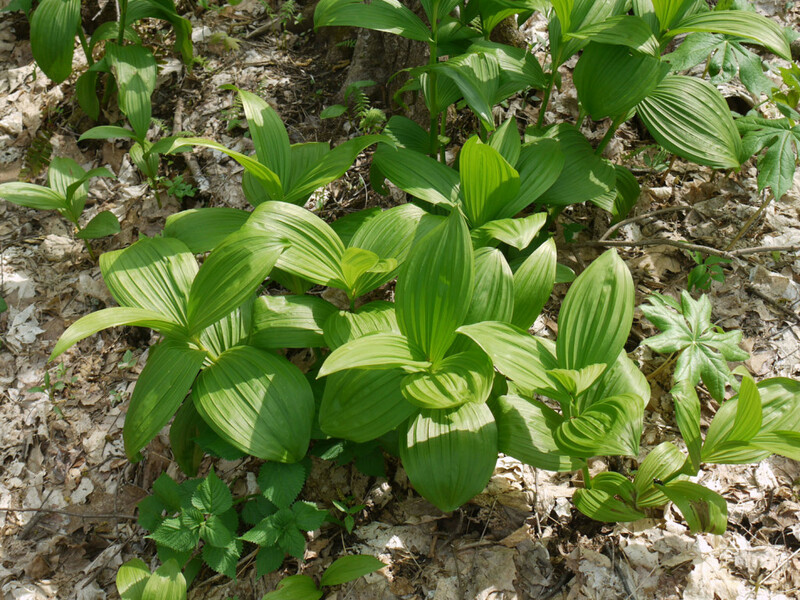 Let’s study each of these “looks similar” plants, particularly in early spring when they are most noticeable with their vibrant light green leaves. First, we can see the leaf venation is different. (This was my first and most significant clue that my local plant was not skunk cabbage.) 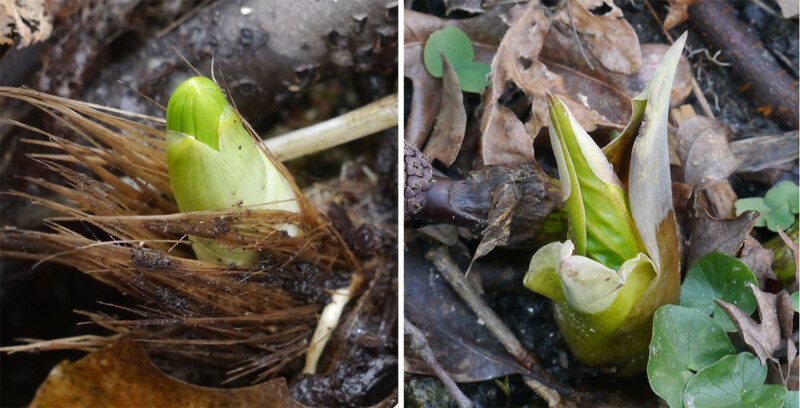 The veins of Green false hellebore are parallel. 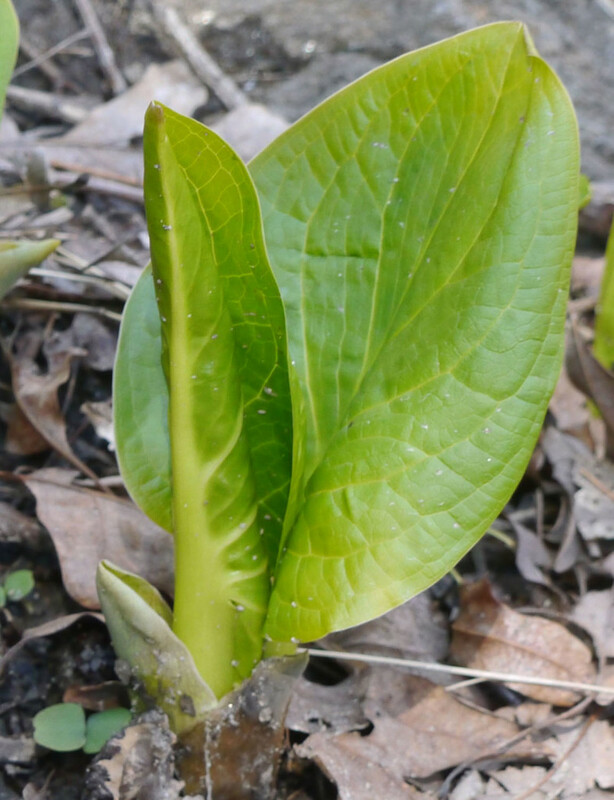 The veins of Skunk cabbage are pinnate — with a strong center vein. 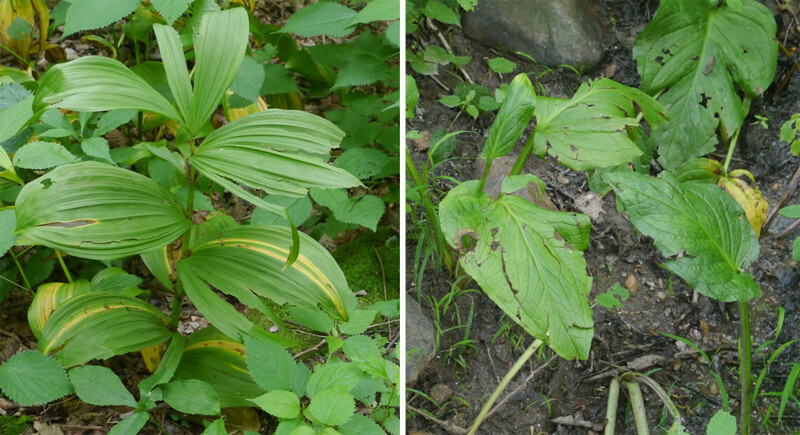 Even though both plants live in the same type of watery habitat, and both plants have leaves arising in a whorl, there are some distinct differences between the plants. The next series of images shows the plants side-by-side so you can clearly see those differences. Starting with the emergence of spring foliage . . .
. . . young plants with what looks like a rosette of leaves . . .
. . . and the view from above . 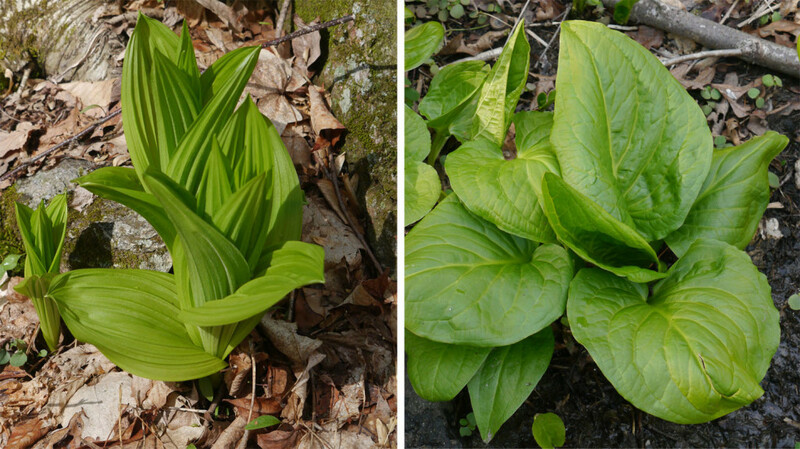 . .
Notice the Green false hellebore’s alternate leaf arrangement (and no leaf petioles) as compared to Skunk cabbage’s rosette of stalked leaves. 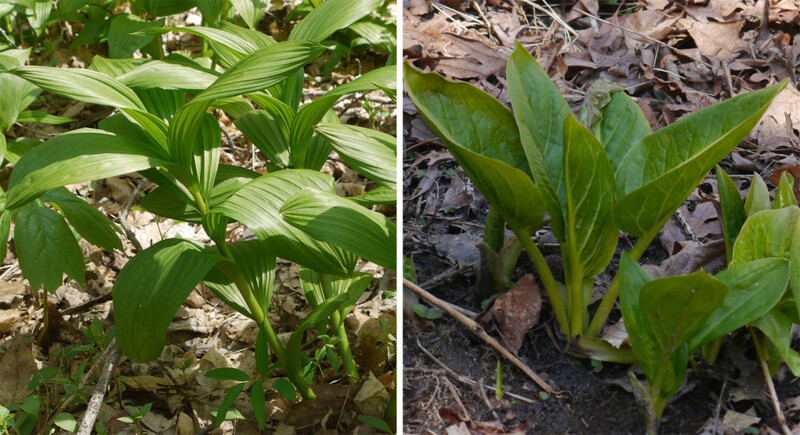 Green false helleborte (Veratrum viride) becomes a six foot tall plant — while Skunk cabbage (Symplocarpus foetidus) remains only 12 to 18 inches in height. By mid to late summer, the plants die back. Each plant has very different types of flowers — at different times in their growing cycle. The focus here has been on the leaves and overall plant since most of us will come across and wonder about this plant when it is first leafing out in the spring. 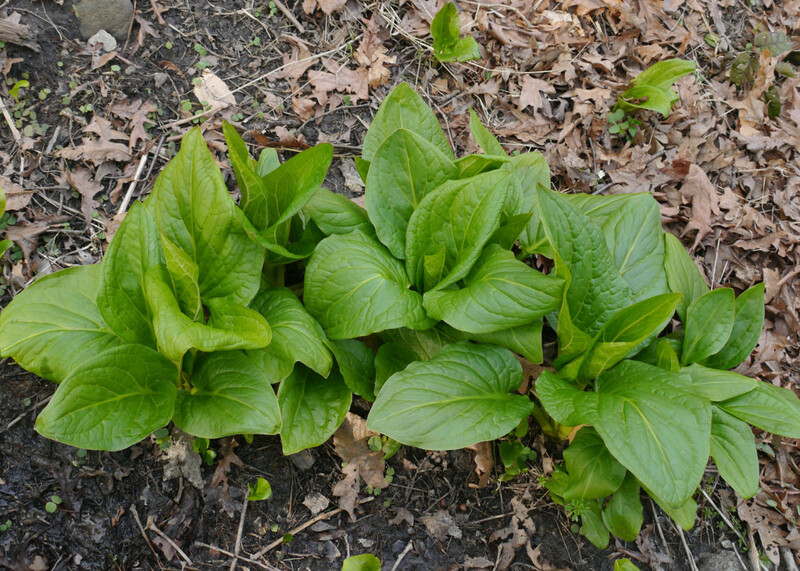 To round out our photo comparisons, here is a final image of a group of Skunk cabbage plants — to compare with the group of Green false hellebore plants at the beginning of this post.